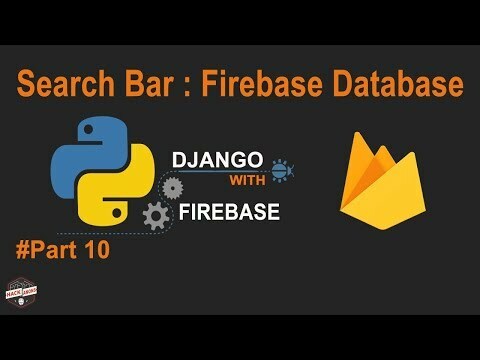 Here i continue teaching Python Django with Google Firebase series, In this post i will show you how to integrate Search bar in Python Django for searching in firebase database. For implementing this we are having different ways such as Using Nested Loops , Using Elastic Search, Using Queries. One of the drawback of firebase database is we can't use any Queries like we use in SQL. In this tutorial we will use concept of nested looping using Pyrebase library for creating a search bar. So, first let's start with Front-end part, for a basic implementation we need a search box and a button to trigger the search function defined our views.py for searching the database and retrieve the results to Django template. We can also implement this search asynchronously by using jquery then we can get suggestions and there will be no need for button a search button. If you want let me know in comments i will create a detailed tutorial on it. Now, here comes the main part we need to get the search string entered in search bar and search it out in firebase database using nested loops and pyrebase library shallow function. Using Get operation extract the search keyword. Create a search function : here we are going to use our existing function created previously for retrieving the data from firebase database. Matching the values using if statement, if matches append to a list. Mapping the list data to Django template. Above code includes only if statement, for else statement code you can have a look on our previous post . In this file we need to add url for accessing this search functionality function. So, wrapping up at last we have successfully implemented search bar in python django for searching values in firebase database and map the result to django template.